The Walker Edison Soreno 3-piece Corner Desk, Black with Black Glass is sleek and it comes with a lot of space for your computer and more. 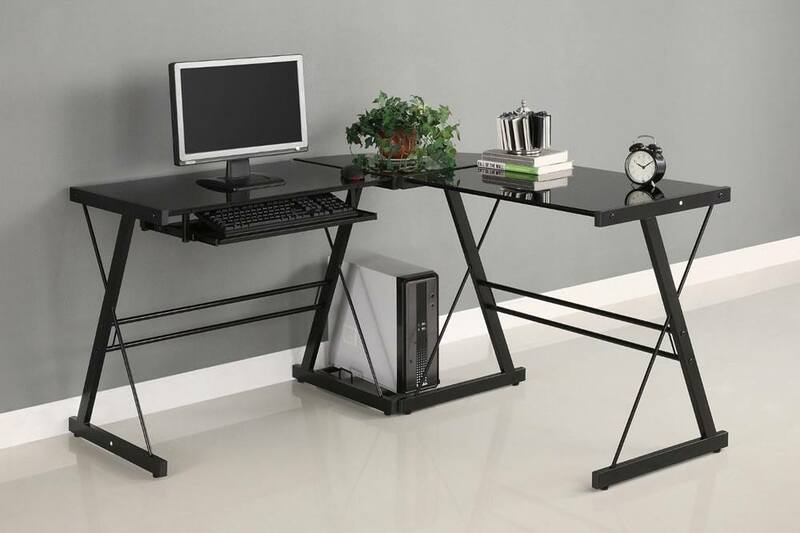 This makes the desk a popular choice among professionals and gamers alike. It’s a highly versatile desk that can be assembled as an L-shaped table, 2 separate tables, or 1 one long table. The Walker Edison Soreno 3-Piece Corner Desk, Black with Black Glass boasts of a sleek appearance. It’s practically perfect for a working desk or a gaming desk, whichever you want to use it for. The style of the Walker Edison Soreno 3 Piece Corner Desk is also a mix of contemporary and modern, owing to its material and the black color. As long as you’re not into traditional and classic furniture, you will love the style of this table. Since the Walker Edison Soreno 3-Piece Corner Desk comes in a black color, at least for this design, it blends well into any room. The color is not too tacky and bright that it stands out of the room. You won’t have to worry about finding the right chair to go with it, or whether your computer and other stuff you plan to put in your desk will blend well with the table. Another plus of the Walker Edison Soreno 3 is that it is L-shaped. You can do anything with an L-shaped desk, and it still won’t take up too much space in your room. You can use one desk for work and the other for gaming. It’s designed in such a way that you can also take out the corner piece to make it into two separate desks – that is, if there are two of you using the table and you don’t want to use it in close proximity to one another. You also have the option of connecting the two desks together without the corner piece, thereby forming one long table. This last option is perfect for LAN parties you plan to host in your home. The thoughtful sliding keyboard is also a nice addition to the table, rather than putting your keyboard on the desktop to take up more space. The keyboard tray can also be attached to either table. So, choose a side you prefer to use the keyboard onto, and you don’t have to worry about making provisions to install the keyboard when there already is one. Another nice addition to the table is the dedicated CPU stand. The CPU stand is actually quite simple, but it keeps your tower off the ground and makes it easier to move around. Because the table doesn’t have shelves and drawers underneath the desk, you have plenty of leg room to stretch your legs in. The other pros worthy of mentioning regarding the Walker Edison Soreno 3 Piece Corner Desk, Black with Black Glass is that it comes in great packaging that the product is really protected inside. There are also extras of each screw provided just in case you misplace one while you’re assembling the table. The assembly time is easy and can be done in just a few hours. There really isn’t anything too bad to say about the Walker Edison 3-Piece Corner Desk, Black with Black Glass except for some minor things. It really is too bad that the table doesn’t have provisions for cable or wire management, but if it’s an issue you can buy zip ties to manage all your cables and put it in order. Since there are no drawers or shelves, you’ll have to put some of your stuff on the desktop itself or buy another storage to hold all your items in. Also, the limbs are hollow steel so you have to be careful during assembly. You don’t want to punch a hole through it. But because the limbs are hollow, it makes the desk lighter. Thankfully, it still can hold the weight of even three monitors on top of the desk. The Walker Edison 3-Piece Corner Desk, Black with Black Glass is a great office desk to add to your home, is versatile, and functions superbly. The desk deserves a 5 out of 5 rating. There are a lot of L-shaped desks out there that can be compared to the Walker Edison Soreno. If you want a different look, like the more traditional or classic L Shaped desk, the Sauder Harbor View might suite your tast. It has drawers and plenty of leg room, too. There’s also the Capuccino Cherry and Slate Bestar Connexion L-Shaped Office Desk with Hutch and Pedestal that not only has drawers, but also has shelves above. The only thing that differs these two latter desks to the Walker Edison Soreno is that it is heavy and it is certainly bigger. If you want a lightweight desk that takes up just the right amount of space, and can be versatile, then the Walker Edison Soreno 3 Piece Corner Desk, Black with Black Glass is the one for you.